I'm terribly sorry to be late in posting this. Two novels publishing within a week of each other has taken it's toll, and an accident. 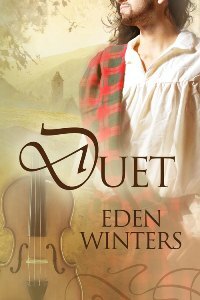 The lovely Charlie Cochet was kind enough to host me on her blog, in celebration of the re-publication of Duet, from Dreamspinner Press. Did you know that the contemporary part of the story was written first, as a novella? Only after a beta asked, "Where's the rest of this?" did Aillil's family and homelife enter the picture. Curious? Check out the post, "Writing in Reverse" at Charlie's blog. And while you're there, enter to win an ebook copy of the novel. Find Duet at Dreamspinner Press.